Following the event, the Turkey Trot Awards Ceremony will be held at 11:00 a.m. at the finish line area on Caitlin Avenue. Frozen turkeys, courtesy of Wegmans, will be presented to award winners. The Distinguished Participant medals will be presented to those individuals who have run during Historic Half Weekend, in Junes Run Amuck, Belleau Wood 8K or Recon Ruck, Quantico Tri or Quantico 12K and the Turkey Trot. Frozen turkey awards are presented to the top three overall male and female, and to the first place finisher in the following agre group categories: 7-10, 11-14, 15-19, 20-24, 25-29, 30-34, 35-39, 40-44, 45-49, 50-54, 55-59, 60-64, 65-69, 70+, and masters male and female. 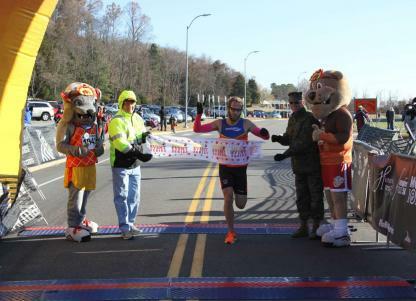 Gobble up the results from the rafter of runners in the Turkey Trot 10K.